The 18-storey IBIS Bangkok IMPACT features 54 interconnecting rooms, 475 twin rooms, 112 queen rooms and 13 rooms for guest with special needs. Each room is equipped with a 32-inch flat-screen LED TVs, an in-room safe and tea & coffee facilities. The spacious lobby area and 500-seat TASTE Restaurant offer floor-to-ceiling natural light. A 24-hour ibis café & bar is available for guests to savour their favourite drinks or snacks, while the ibis Web Corner offers guest WIFI access and opportunity to catch up on work while listening to their favourite songs on the digital Jukebox. Access to downtown Bangkok and both airports is also convenient via public transportation, and the hotel offers ample parking. IBIS Bangkok IMPACT is also well-positioned to cater to increased demand in the area, which will welcome a water park, go-kart track, office complex, shopping centres, beach club and marina, and the new Metropolitan Rapid Transit (MRT) Pink line expected to launch in 2020. IBIS Bangkok IMPACT is a 15-minute drive from Don Mueang International Airport and 30-minute drive from downtown Bangkok. The hotel is served by an array of transportation options such as public vans, IMPACT Link vans connecting to the Bangkok Mass Transit System (BTS) Mochit station and the MRT Chatuchak Park station. 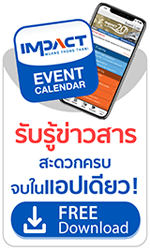 and visit www.ibisbangkokimpact.com for more information.